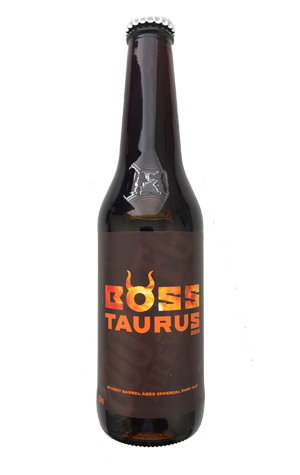 In this third Boss Taurus collaboration with Cellarbrations Carlisle and its associated beer club, Grain Cru, the whiskey barrel aged imperial dark ale has really come into its own. What debuted in 2015 as a barrel aged, imperial version of Bootleg's core range Raging Bull now feels more standalone – a majestic bull in the Bootleg paddock, something that bovine enthusiasts will note the name riffs on. Aromas of choc-caramel fudge, vanilla, a hint of soft liquorice and a tease of the whiskey to come lead the way, with tasting only amplifying these as dark stonefruit and cola arrive, riding on a wave of warming booze and locally sourced stave-derived dryness. Although a mid-October release, this sipper deserves an open fire and contemplative mood to best celebrate its full expression. As an aside, it’s interesting to see the inclusion of the production year on this label, something that’s becoming more commonplace in higher ABV, cellar worthy beers. This not only extends on some of the recently released IBA guidelines but will make vertical tastings easier to understand when deep into sampling beers with alcohol content nearing double figures.